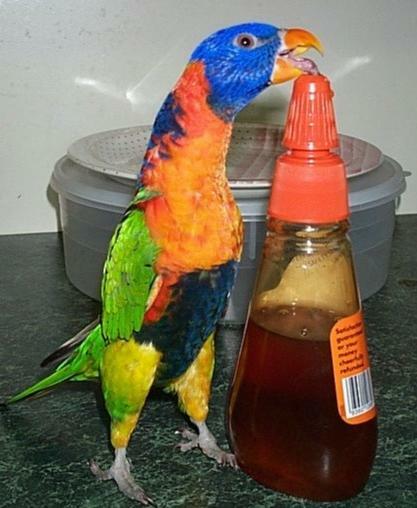 You all must know by now that I have a Lorikeet called Larry. Larry is a girl by the way! Well it seems that Larry has tugged the heart-strings of someone special. Yes, I honestly think that love is in the air. Larry received a letter first from Bundi (a lorikeet that belongs to one of our Club members). But things are hotting up. Bundi has now sent Larry a Poem. I think we can all see, that Bundi thinks my 'Larry' is a 'bit of alright'. And Larry...well Larry hasn't been herself ever since she received this wonderful message of love. I'm a Red Collared Lorikeet. And hang on dearly with my feet. typing and searching things out. and I began to shout!!! With feathers of bright green. And a head of blue. Your Mum's name is Sue. I'm staring at on the net. I wonder why we haven't met? Hoping she feels the same. Or just a big tease. It's a girl called "Larry"
AND THIS MONTHS SPECIAL MEMBER! Please note that it is covered by copyright and cannot be used in any way whatsoever unless written permission is granted by John.